Alice in Wonderland. 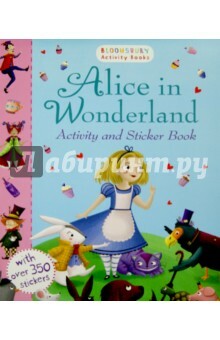 Activity and Sticker Book Bloomsbury What happens when Alice follows the white rabbit? Find out with this magical activity book, packed full of colourful stickers. Bloomsbury Activity Books provide hours of colouring, doodling, stickering and activity fun for boys and girls alike. Every book includes enchanting, bright and beautiful illustrations which children and parents will find very hard to resist. Perfect for providing entertainment at home or on the move! "Alice in Wonderland. Activity and Sticker Book"
Аннотация к книге "Alice in Wonderland. Activity and Sticker Book"
What happens when Alice follows the white rabbit? Find out with this magical activity book, packed full of colourful stickers. Bloomsbury Activity Books provide hours of colouring, doodling, stickering and activity fun for boys and girls alike. Every book includes enchanting, bright and beautiful illustrations which children and parents will find very hard to resist. Perfect for providing entertainment at home or on the move! Очень классная книжечка с большим количеством наклеек, кратким содержанием. Яркие картинки, разные задания. Отличный вариант для обыгрывания книги и тренировки навыков говорения. Для дошкольного и младшего школьного возраста отлично подойдёт. Я хотела бы и другие книжечки этой серии. –27 % Выгода 190 ₽ My Pretty Pink Ballet. Activity and Sticker Book 1 рец. –27 % Выгода 176 ₽ My Spring Activity and Sticker Book 1 рец. Похожие на "Alice in Wonderland. Activity and Sticker Book"
–40 % Выгода 120 ₽ Алиса в Стране чудес = Alice's Adventures in Wonderland + аудиоприложение LECTA 1 рец. Если вы обнаружили ошибку в описании книги "Alice in Wonderland. Activity and Sticker Book", пишите об этом в сообщении об ошибке. Спасибо!